BACKUP DATABASE permission denied in database 'AdventureWorks'. The backup failure is also recorded in the SQL Server log and the Windows Event Log. However, the user that initiated the backup is not identified. Another way to grant backup rights is by making the user a member of the db_backupoperator role e.g. 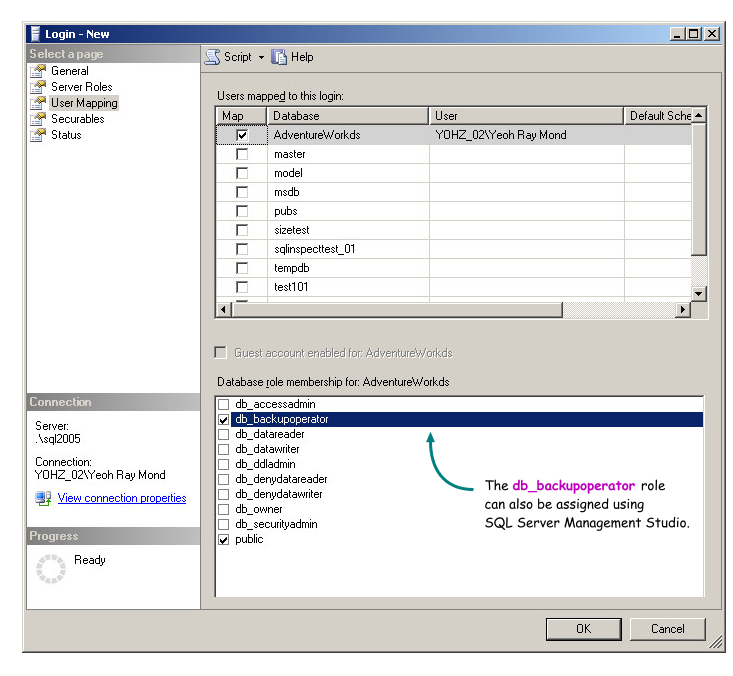 or using SQL Server Management Studio e.g. Users with the db_backupoperator role are also granted rights to run the CHECKPOINT and the DBCC commands. User does not have permission to RESTORE database 'backuptest'. If the database already exists, the user can perform the restore if he is a member of the dbcreator fixed server role, or is the database owner.